San Diego Art News San Diego Art News for local San Diego Artists. Here you will find useful information about San Diego Art News for local San Diego Artists. Here you can learn News Articles, Recent Newspaper Publications, Press Kits and Artist Bios, Important Art Links and much more! Steve Brower, Todd Krasovetz, painting by Todd, Kourtney Krasovetz, and Coleen Freeman. Coleen Freeman, owner of Rancho Santa Fe Estate and Fine Jewelry, and Fine Art artist Todd Krasovetz, along with his business partner and Rancho Santa Fe resident Steve Brower, will host an event on Thursday, May 2, from 5-8 p.m. in the courtyard behind Rancho Santa Fe Estate and Fine Jewelry, located at 6024 Paseo Delicias in Rancho Santa Fe. In celebration of Mother’s Day (May 12), a percentage of proceeds from sales at the event on May 2 and throughout the month of May will benefit the “Mommy and Me” program administered by the Armed Services YMCA at Camp Pendleton. The event will commemorate the grand re-opening of the jewelry store at its new location on Paseo Delicias and the grand opening of artist Todd Krasovetz’ interactive studio and art gallery. Appetizers provided by Dinners by David and La Reine des Macrons, wine, entertainment by Ean Corbett, opportunity drawing and a miniature military F18 jet display will be offered. The event is free and open to the public, however, reservations are required. To RSVP, contact Kourtney Krasovetz at 619-730-8104 or kourtneykrasovetz@yahoo.com by Monday, April 29. Rancho Santa Fe Estate and Fine Jewelry was established 30 years ago and specializes in a variety of services, including the acquisition, consignment and sale of gold, diamonds, watches and all other precious metals and gemstones. The inventory of items for sale is an eclectic selection of new, antique and designer pieces. The store features an on-site Master Jeweler with 30 years’ experience in his trade and is qualified to create a wide variety of custom designs. Other services offered include expert cleaning, re-sizing, jewelry and watch repair, pearl re-stringing and appraisal capability. Owner Coleen Freeman has 25 years’ experience in the jewelry business. During this time, she has refined her taste and technical expertise in the industry. In the five years she has owned Rancho Santa Fe Estate and Fine Jewelry she has become a mainstay in the community and has established an impeccable reputation for her integrity and sincerity. American artist Todd Krasovetz was born in Frankfurt, Germany and is internationally renowned for his contemporary abstract expressionism style of painting. Krasovetz’s influences can be tied back to the works of Sargent, Matisse, Van Gough and Pollock. Krasovetz is also recognized for his military artwork; two of his paintings, titled “Wings of Hope” and “Hidden Wings,” that depict Navy corpsmen in action were commissioned for the set of the Lifetime TV show “Army Wives.” The original paintings are on permanent display at Naval Hospital Camp Pendleton and the Corpsman Field Training Center on base. “Army Wives” features hand-painted prints of the originals. Todd’s business partner, Steve Brower, is an art aficionado, as well as an accomplished pilot who flew as a Captain for American Airlines for 25 years and who now flies a private corporate DA10 aircraft. The Armed Services YMCA (ASYMCA) “Mommy and Me” program is a preschool parent network guided by ASYMCA preschool teachers that provides parents of toddlers from 18 months to 5 years old with tools that enable them to begin and sustain their young child’s educational development. ASYMCA Lil’ Friends and Kindertyme programs emphasize kindergarten readiness, socialization and positive parent/child interactions. Both programs meet twice a week for one hour and are offered at various locations throughout Camp Pendleton. Call 760-385-4921 or visit http://www.camppendletonasymca.org/services.html. For additional information regarding Rancho Santa Fe Estate and Fine Jewelers, log onto www.ranchosantafejewelers.com, call 858/756-4047 or email at rsfjewelers@yahoo.com. Todd Krasovetz may be reached at 619-490-9985 or through his website at www.toddkrasovetz.com. Todd Krasovetz is one extremely busy individual. He is a painter of abstract and “military art,” a father, husband, businessman, and an all around San Diegan (a resident of Shelter Island). In the realm of “military art,” Krasovetz has had one of his paintings set in Lifetime’s television show Army Wives, as well as a piece commissioned by the Walter Reid Military Hospital in Bethesda, Maryland. Though Krasovetz is known for his military art work, he maintains a driving passion in creating modern abstract art. Krasovetz has shown and his abstract work in New York City at the Agora Gallery from June 12 to July 3, was commissioned to paint a mural at La Bec Fin restaurant in Philadelphia, and has had his art shown locally in La Jolla and in his Point Loma Studio. ” Due to his talent level, Krasovetz is able to be successful at mainly two styles of art, making the journey in the artistic expression continuously fresh and dimensional. Despite remaining active in the local market, Krasovetz has exhibited and sold some of his soft abstracts, “Woman and a Martini Glass,” and “Red Wine Late Night,” at the Agora gallery. Similar to Pollock’s “action painting,” which Krasovetz refers to as “event painting,” the artist creates impressive large scale works reminiscent of Sargent, Matisse, and Van Gogh. Pollock-esque in nature, Krasovetz says of the composition process, “I lay the canvas down, working off the ground, create the basic design, and then continue with the composition. When I’m working, I like to think of the process as ‘the 30,000 foot view’ approach.” Utilizing oil paint, Krasovetz works horizontally – accelerating the drying process, and allowing the artist to delve deeper into his combinations of warm and cool hues. Emitting these contrasting notes, which emerge as translucent and metallic layers, resembling the ebb and flow of water. Ornate patterns and undisclosed narrative qualities embellish the plane. As a whole the portraits evoke a sense of fragmentation, memory and emotionality, catalyzing around the evocative feminine mystique, which they take as their central theme. “I centralize the female figure as the design for my pieces,” says Krasovetz. “Approaching the work in a Pollack/Matisse style, all the while adding a little more realism as a foundation, I typically make the original sketch. Currently, most of my representation is in New York, but since my studio is in Point Loma, it allows for people to see what I’m doing locally.” Though there are many artists in this genre, Krasovetz, with his set influences and style, is definitely a rare find in San Diego. The future will see Krasovetz hosting shows soon in San Diego once again, since he propagates his work in both the east and west. February 21 2013 Disney/ABC Studios Purchases “Battle At Roberts Ridge” By Artist Todd Krasovetz for TV Show. January 2, 2012: ABC Studios Purchases Art for the hit television show “Army Wives”!! 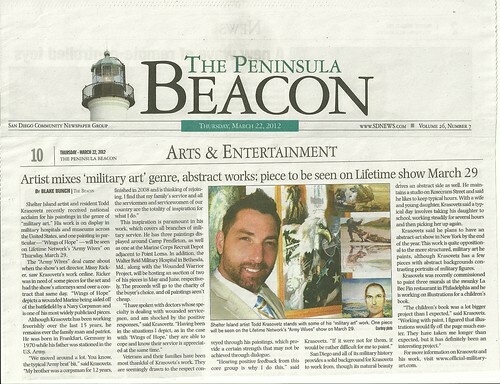 MARCH 23, 2012: BEACON NEWSPAPER Publication: Artist Mixes “Military Art” Genre, Abstract Art! MARCH 15, 2012: DEL MAR, CA TIMES NEWSPAPER Publication: ABC STUDIOS Lifetimes Army Wives and Todd Krasovetz! 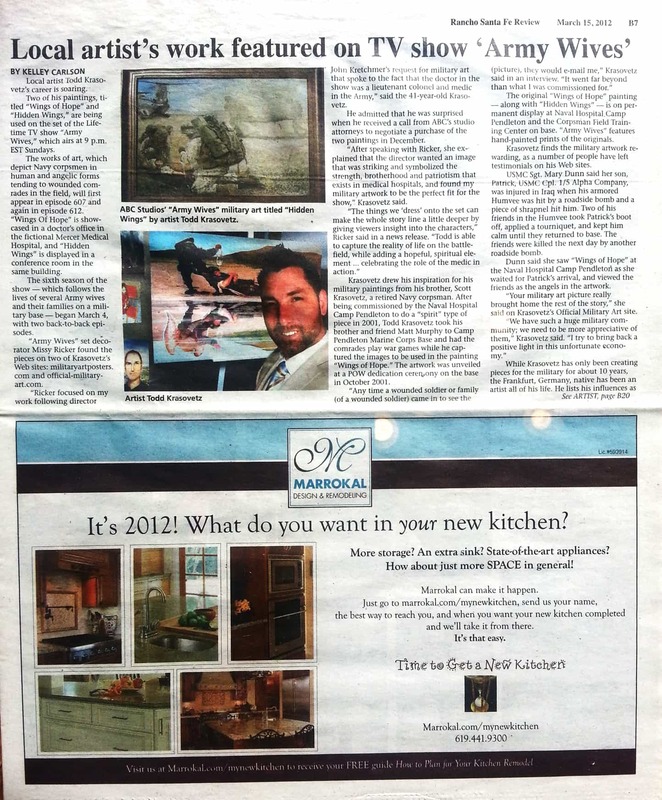 MARCH 15, 2012: RANCH SANTA FE TIMES, CA NEWSPAPER Publication: ABC STUDIOS Lifetimes Army Wives and Todd Krasovetz! DEC 2, 2011, ABC Studios “Army Wives” Purchased Art by Todd Krasovetz to be Showcased on the Set Spring of 2012!! January 4, 2012: Read Recent News From The San Diego Union Tribune About Lifetimes Army Wives and Todd Krasovetz! December 8 2011: Examiner Magazine News Article: ABC Purchases Military Art Titled “Hidden Wings” & “Wings OF Hope” by Todd Krasovetz. More Recent News, Article Press Releases. New York Contemporary Art Gallery: Agora Gallery in Chelsea New York Press release for Artist Todd Krasovez. NEW YORK, NY – Chelsea’s Agora Gallery will feature the original work of San Diego artist, Todd Krasovetz in Pulse of Abstraction. The exhibition is scheduled to run from June 12 through July 3, 2012. Internationally known for his published contemporary realist painting, Todd Krasovetz’s soft abstractions forge new artistic territories evoking the power, tempo and tonal complexity of musical composition. Born of a spontaneous process very close to Pollock’s ‘action painting’ which Krasovetz describes as ‘event painting,’ these bold and expressive large scale works on canvas trace back through the heroic lineages of Sargent, Matisse and Van Gogh. Working horizontally, Krasovetz’s process involves accelerating the drying time of the oil paint which he splashes freely into the artistic ether. Combinations of warm and cool hues emit contrasting notes that emerge as translucent and metallic layers resembling the ebb and flow of water. Ornate patterns and undisclosed narrative qualities embellish the plane. As a whole the portraits evoke a sense of fragmentation, memory and emotionality, catalyzing around the evocative feminine mystique, which they take as their central theme. Born in Frankfurt, Germany, Todd Krasovetz currently lives and works in San Diego, California. This summer Agora Gallery’s elegant exhibition space comes to vibrant life, with refreshingly beautiful artworks. In Pulse of Abstraction viewers are inducted into a world where almost anything seems possible, with forms displaying unsuspected powers of mutability and vitality and colors moving around the canvas in a way that draws eyes and hearts after them. The Manifestation of Milieu demonstrates the considerable impact that an artist’s cultural heritage and exposure to urban environments and the natural world can have on their work, as each artist uses what they know to combine personal understanding with images that speak to everyone. The hues of The Saturated Palette color our perspective in a resplendent, engaging manner that reminds us both of the beauty that exists in the world and in the importance of viewing what we see in a positive way. The exhibitions open on June 12, 2012 and will run until July 3, 2012. The opening reception will take place on the evening of Thursday June 14, 2012, from 6-8 PM. As usual, art enthusiasts are warmly invited to attend and meet some of the talented artists responsible for these delightful pieces. Featured artists: Pulse of Abstraction: Andrea Adka (“Andrea Jones”), Sharon Brill, Michelle Chu, Laila Khan Furniturewalla, Donna Howard, Christine Jaksch, Allen Jones, Todd Krasovetz, Sandra McRae, Kamil Sarnowski The Manifestation of Milieu: María José Alba, Grace Arledge, Monique Daneau, Eul Hurley, Milena Miteva, Bruce Leslie Thomas, Lone Tratt The Saturated Palette: Zivi Aviraz, CHAREST, Esther Cruz, Michael Harris, Sally Painter About Agora Gallery Agora Gallery is a fine art gallery, established in 1984 and located in the heart of New York City’s Chelsea art galleries district. It is famous for showcasing a spectacular array of talented artists from around the world and around the corner, while providing quality and original art to collectors. Exhibitions are usually group exhibits, presenting the work of a number of artists, but sometimes solo exhibitions focus on the work of one particular artist. 2005 New American Pride MCRD Museum Historical Society- Command Museum: Title: Savior in a Storm Branch Medical Clinic Newspaper.